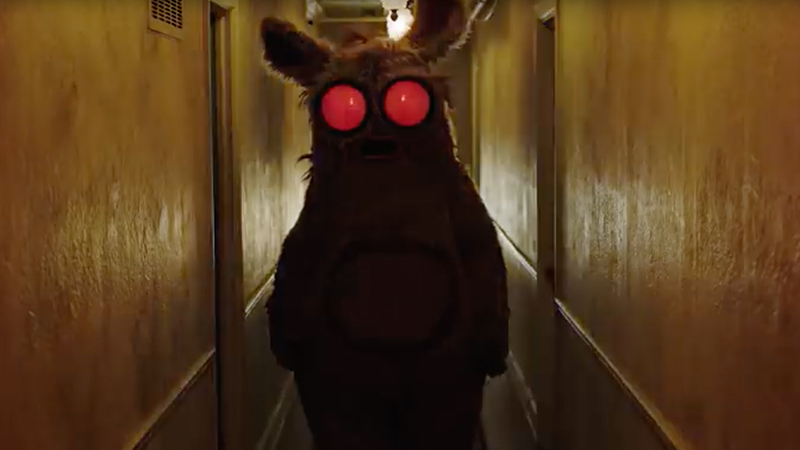 Hulu has released the first teaser trailer for the horror anthology series Into the Dark, and it looks absolutely insane. Check it out below! Each episode is inspired by a holiday from the month of its release, but all will feature Blumhouse’s signature genre/thriller spin on the story. Blumhouse Television, drawing on its deep talent relationships, is working with a broad section of filmmakers, creators and actors to bring this unique, first-of-its-kind series to Hulu audiences. The first story, “The Body,” premieres on Friday, October 5. Set in the selfie culture of Los Angeles on Halloween night, “The Body” follows a sophisticated, overconfident hitman who always carries out his work in style. He decides to take things even further one day by transporting his latest victim in plain sight, correctly assuming that self-absorbed LA partiers will simply be enamored with his elaborate “costume.” Eventually, as his window of opportunity to dispose of the body begins to close, Wilkes’ true colors reveal themselves to some groupies that have latched on to him. It becomes a battle of will and wits. Based on a short film of the same name, “The Body” will be directed by Paul Davis and will star Tom Bateman (Murder on the Orient Express, Vanity Fair) as Wilkes, the suave, professional hitman, and Rebecca Rittenhouse (The Mindy Project, Blood & Oil) as Maggie, a feisty, whip-smart, woman who becomes captivated by Wilkes the more she learns of his real profession. Aurora Perrineau (Blumhouse’s Truth or Dare) plays Dorothy, who uses her cynicism and resourcefulness to try to outwit Wilkes. She is joined by David Hull (Crazy Ex-Girlfriend, Insecure) as Allan, and Ray Santiago (Ash vs Evil Dead, Meet the Fockers, In Time) as Jack – both are Hollywood and Internet wannabes whose cluelessness complicates the evening time and again. The script was co-written by Paul Fisher, who will also serve as a producer on the project, and Davis. Alexa Faigen (Safe House, Love Happens) is executive producing for Blumhouse. Into the Dark’s second installment, to be released on Friday, November 2, will be “Flesh & Blood,” directed by Patrick Lussier (My Bloody Valentine, Dracula 2000). Dermot Mulroney (August: Osage County, Shameless, The Wedding Date) stars as Henry, a doting father trying to help his daughter, Kimberly, a teenager suffering from agoraphobia, who has not left the house since her mother’s still-unsolved murder. Kimberly is played by newcomer Diana Silvers, and Tembi Locke (Dumb and Dumber To, Eureka) plays her therapist. Set on the eve of Thanksgiving a year after her mother’s death, Kimberly begins to suspect that she is in danger in the home, but she can’t leave and doesn’t know who she can trust.